This rice can tolerate brackish water but is on the brink of extinction. Can government save it? Kamalakar is one of the 3,000-odd farmers still cultivating this unique saltwater-tolerant rice variety of Karnataka. It is pest-free and resilient to environment stress. “The rice has a thick coating of red bran. So it is digested slowly and is good for hardworking people like us,” says farmer Gowri R Gowda. “It has a nice flavour, which conventional rice does not have. Besides, it has curative properties,” she adds (see ‘The healer’). Traditionally, kagga rice was cultivated on some 2,000 hectares (ha) on the bed of Aganashini creek in Uttara Kannada district of Karnataka. But the area has shrunk to less than 1,200 ha. Poor market returns, commercial prawn cultivation and government apathy is fast wiping out this rice variety, though its cultivation is easy and requires little labour, say farmers. Kagga rice suits the health needs of farmers working in the saltwater paddy fields of Aganashini creek in Uttara Kannada district of Karnataka. It not only gives farmers energy to work long hours, but also works as a coolant. “Long hours in the paddy fields, with the hot sun above and the glare from the water is very exhausting,” says farmer Gowri R Gowda. Kanji (soup) made from this rice prevents heatstrokes and keeps one cool, she says. The kanji is also given to people suffering from diarrhoea and other digestive problems. This apart, kagga rice makes an excellent baby food. “Eating this rice regularly keeps a person strong and fit. If we eat conventional rice for even a month, our stamina dips,” she says. It does not require any investment and there is no risk of crop failure, says Shridhar Pai of Hollanagadde village in Kumta taluk. Pai is secretary of Kagga Bhatta Belegar Sangha, a union of Kagga cultivating farmers. “We soak the seeds in the creek for a week, then sow the seedlings after manually puddling the land. Within a week, seedlings rise six inches above water. After this, the only work left is harvesting,” he says. Only drought or other extreme weather conditions can hamper its production. And impact from drought is unlikely because cultivation happens within the creek bed. Farmers say they get assured yield of 1,000 to 1,200 kg per acre (0.4 ha) per season. Paddy fields double up as prawn cultivation areas. 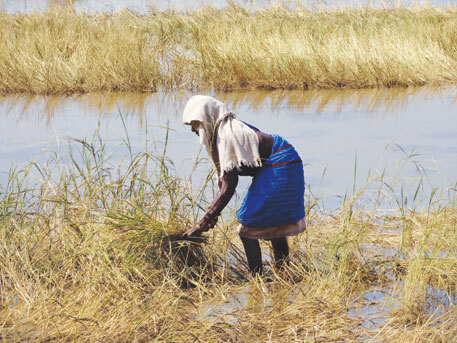 In June, farmers sow kagga rice seeds and in September contractors release prawn seeds into the wet fields. “In January, after the prawn harvest, contractors pay us for allowing them to farm on our land,” says Pai. Kamalakar earned Rs 25,000 this year from his 1.4 hectares. “After the prawn harvest we get leftover prawns as well. So, the field assures us food round the year,” says Gowri. But dismal market situation plays spoilsport. “Our rice is coarse and does not fetch more than Rs 10 per kg,” says Ramachandra M Pattagar of Lukkeri village. In comparison, white and fine-grained rice fetches Rs 12 or more per kg. Many farmers, who also own dry land, give up kagga cultivation for white rice. Others get their rice polished to get a better price, he says. “Kagga rice gets rejected in the market because people are not aware of its qualities. Government agencies make no effort to push it,” says G Krishna Prasad of non-profit Sahaja Samruddha, which is helping kagga farmers revive their tradition. Many farmers have given it up for petty jobs in shops and other establishments and are content with the money they get just from prawn cultivation, says Pai. With shrinking kagga fields, some groups imposed strict measures. Kagga cultivation processes, such as puddling and guarding the crop, require collective effort. “In our 165-ha paddy cluster, spread over Hollanagadde, Maasur and Lukkeri villages, we had to impose fine on farmers who were not cultivating their land. This was done to prevent paddy fields from falling into disuse,” says Pai. The government has made no effort to repair bunds and gates, which maintain the water and salinity levels in the paddy fields. “These were last repaired by the Ramakrishna Hegde government in the early 1970s,” says Pai. Hanumantha Pattagar of Lukkeri complains that the agriculture department does not provide them with kagga seeds. “The department asks us to adopt improved rice varieties, such as Suvarna and Sona Masuri, but these do not grow in brackish water,” he says. In the recent years, many farmers have lost crops due to extreme weather conditions. As a consequence, they have seeds too. To help them, some farmer groups have set up seed banks and started marketing endeavours, but these are not sufficient. “If the government buys our rice for seed and provides it to farmers, both the seed and market problems can be solved,” says Pattagar. But government officials say there is no provision to support kagga farmers. The agricultural department can only provide certified seeds produced by the Karnataka Seed Corporation or the agriculture university, says S V Hegde, assistant director of the agriculture department, Kumta. Regarding repair of bunds, he says kagga land is recorded as wetland and not as agricultural land in the revenue records, so it does not fall under the department’s jurisdiction. The agriculture department and scientific institutions agree that kagga is an important germplasm and regard it as endangered. “Most salt-tolerant varieties we have are tolerant to calcium, magnesium, carbonates and bicarbonates. Only kagga is tolerant to sodium,” says G V Naik, scientist at the University of Agriculture, Kumta. Yet, they want to replace it with improved varieties. “Its yield is 2,000 to 2,200 kg per ha compared to 45 to 50 per ha in improved varieties,” says Naik. “And the grain is suitable only for parboiled rice.” The university is trying to correct these lacunae in the seed. This may prove harmful, say farmers. Use of improved varieties has already increased use of chemical fertilizers and pesticides. “The government refuses to acknowledge the crucial socio-ecological role it plays in protecting the community,” says Prasad. “It is an important support system”. Sahaja is, therefore, demanding a change in government policy to protect indigenous rice varieties and their cultivars. “But despite our repeated pleas, we have not received any response,” says Prasad. Unless the government changes its iron-curtain attitude, the resilient rice variety, so uniquely suited to the ecosystem, may be lost forever.